energy. Throughout the city, pavilions have been set up to promote and educate people about environmental issues. 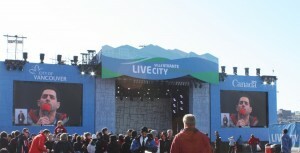 Live City Vancouver in Yaletown is one example of this initiative. This is where the Vancouver House is located, showcasing ‘Vancouver Green Capital’, an economic development programme which highlights the work of local entrepreneurs and community leaders. 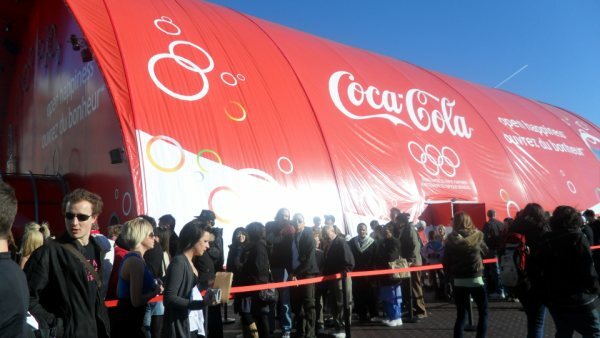 The Pavilion itself, supported by the Games’ official sponsors, is an example of the City’s commitment to sustainability. It is built from recycled material such as old wood beams from a North Vancouver high school and salvaged works of art from local designers. There is an interactive table where visitors can leave their eco messages for everyone to view. 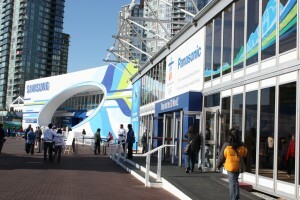 Also in the Live City Vancouver, next to the Vancouver House, is the Panasonic Pavilion where people can submit their own ideas about how the company should tackle environmental issues. “We want to contribute as much as possible to the sustainable games. Panasonic have set a target to become the number one eco-friendly company in the electrical industry”, said Yoko Nakamizu, Panasonic’s Olympic Public Relations Manager. 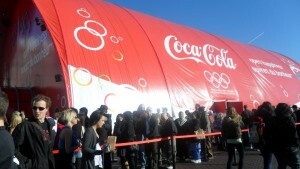 In the same space, Coca-Cola is also present. Claiming to be the Games’ greenest sponsor, their pavilion opens with a display of their drink bottles through the decades introducing their newest design which is made from 30% recycled material. Similarly, the Coca-Cola staff’s uniform is made entirely from recycled material, the jackets being made from 25 reconditioned cola bottles. There is also an interactive room, which includes a display explaining the recycling process and a polar bear mosaic made of pledges by Canadians on how they live sustainably. To coincide with the Olympic Games, Coca-Cola also launched an aboriginal art bottle program designed to give First Nation communities in Canada the opportunity to showcase their artwork to the world. Six art-bottles are on display in the pavilion and a further nine are scattered throughout the city. After the Games the bottles will be auctioned online. “All proceeds will go to the aboriginal youth legacy fund which is part of a group of programs designed to continue after the games” according to Mandy Denning, Coca-Cola’s spokesperson. Vancouver officials hope that their Winter Olympics will be remembered not only for their sporting achievements but also for successfully promoting green initiatives. Rachael McAlister and Erin Linton are Broadcast Journalism Post Graduate students at the University of the West of Scotland and are contributing to Culture @ the Olympics during their time in Vancouver.